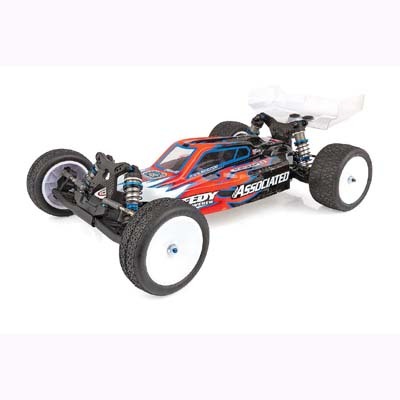 ASC90022 - RC10B6.1 Factory Lite Team kit - Features: Features: Direct drive system for reduced weight and better acceleration. MIP Pucks(TM) 7075-T6 aluminum outdrives. MIP Pucks(TM) Bi-Metal(TM) lightweight R-CVD bones, 67mm. Adjustable diff height can be matched to various ride heights. Machined pistons included for better fit and smoother operation. V2 springs for a more reactive and nimble feel. One-piece shock bushing to make assembly easier. Molded spur gear guard to help protect body from damage. 3-gear Laydown Stealth(R) transmission for lower and forward CG. Innovative rear arm with molded inserts for ultra-fine lower shock mount adjustment. Lightweight aluminum top shaft. Aluminum C and D arm mounts included for a large range of anti-squat and toe adjustment. Heavy-duty V2 routed graphite front shock tower with tower guard. Factory Team upgraded ball bearing kit included (now oiled instead of greased for less drag). Aluminum 7.0mm rear clamping hex with laser etching. Aluminum 5.0mm front axle with adjustable height. Rear hubs feature large bearings and the easy-insert system to adjust camber link position and rear axle height. JConcepts(TM) lightweight B6 clear body and wing included. Aluminum 5.0mm front axle with adjustable height.